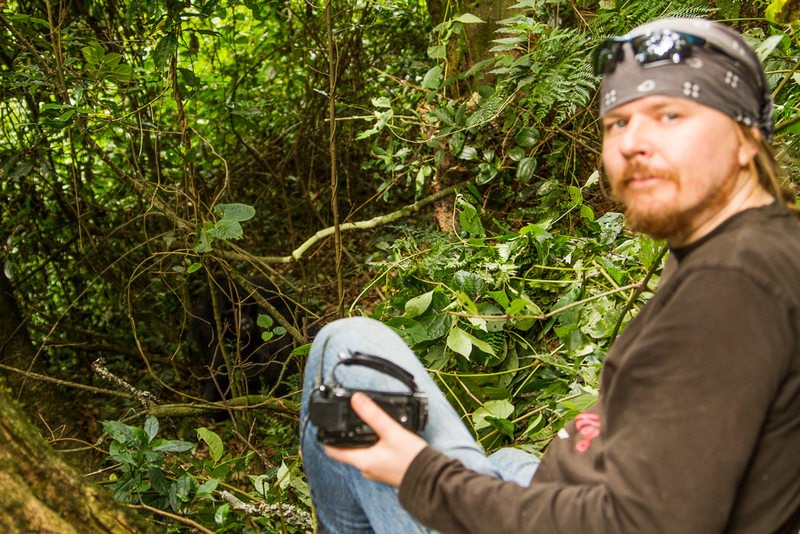 This was on our bucket list for a long time…to see gorillas and chimpanzees in their natural habitat. And last year, we made it happen! 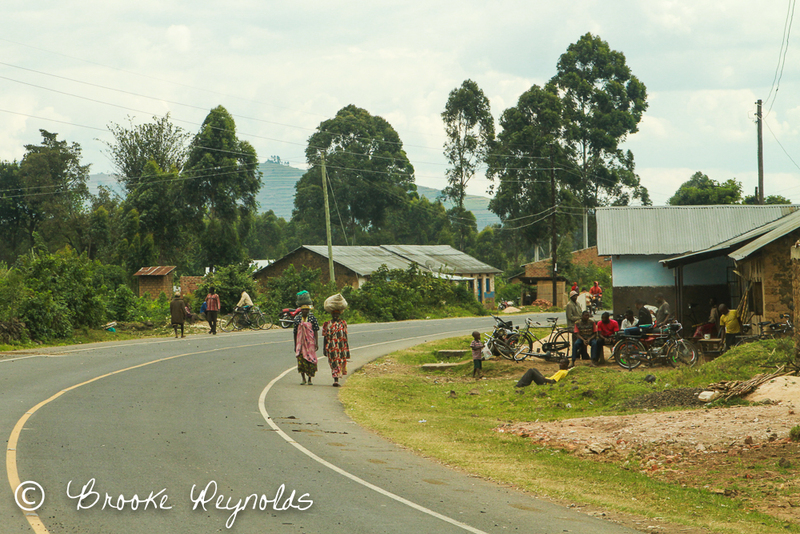 On the way to Bwindi. 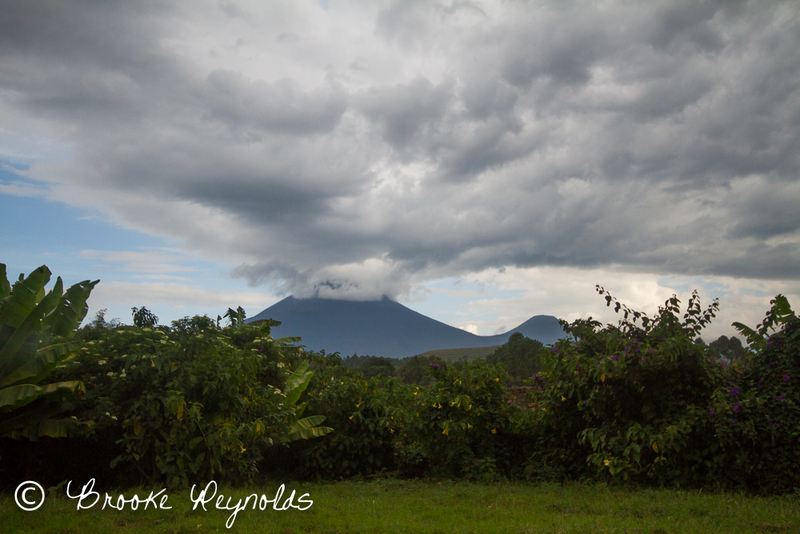 From this view, we could see the Congo, Rwanda and the Virunga Volcano. 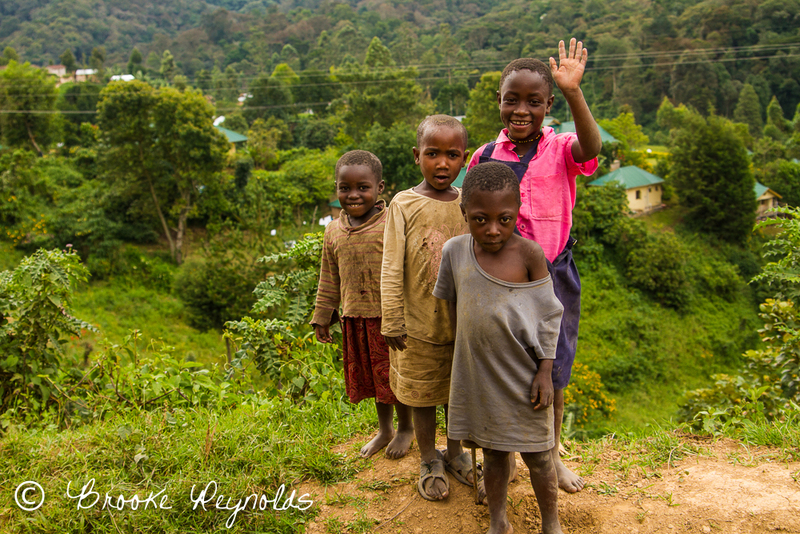 The Bwindi Impenetrable National Park in Uganda is one of the best places in the world to see mountain gorillas- if you are lucky to find them. 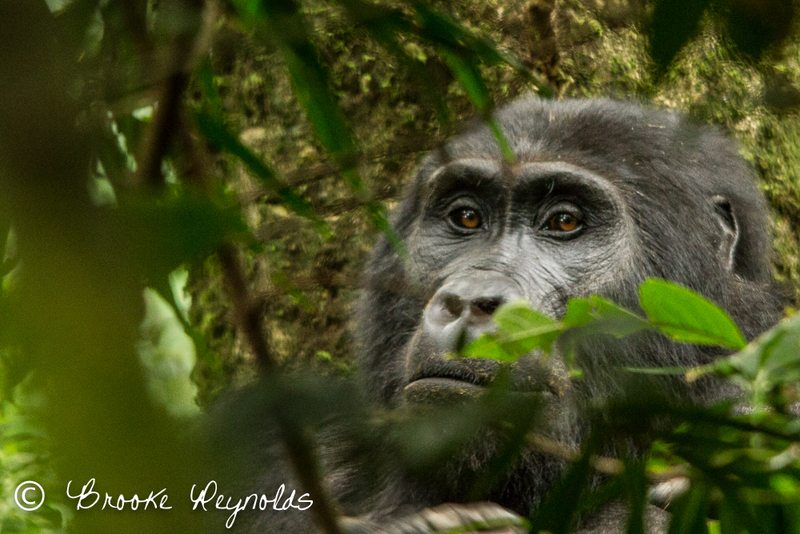 They are wild and are not tracked by tagging, but certain gorilla families are observed in their natural habitat for research and trackers go out in the early morning to find out their general vicinity. They move fast though, so sightings are never guaranteed. 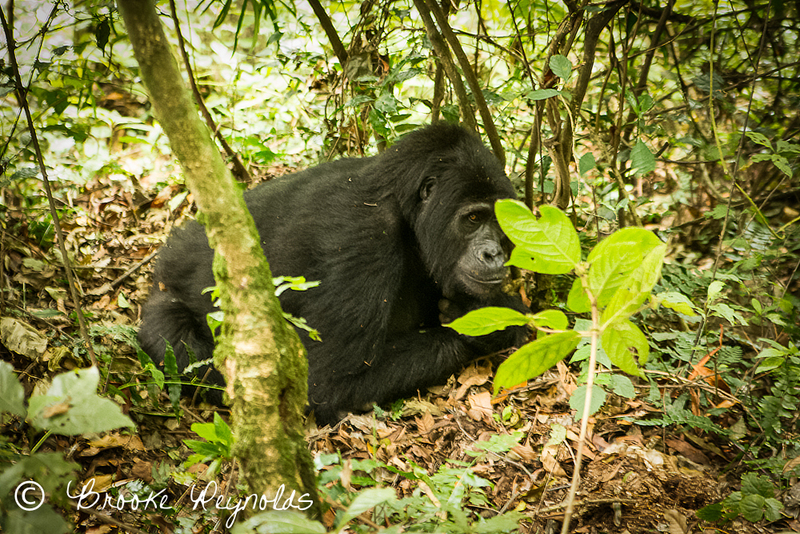 We decided to go with Gorilla Tours who arranged it all – they were great! 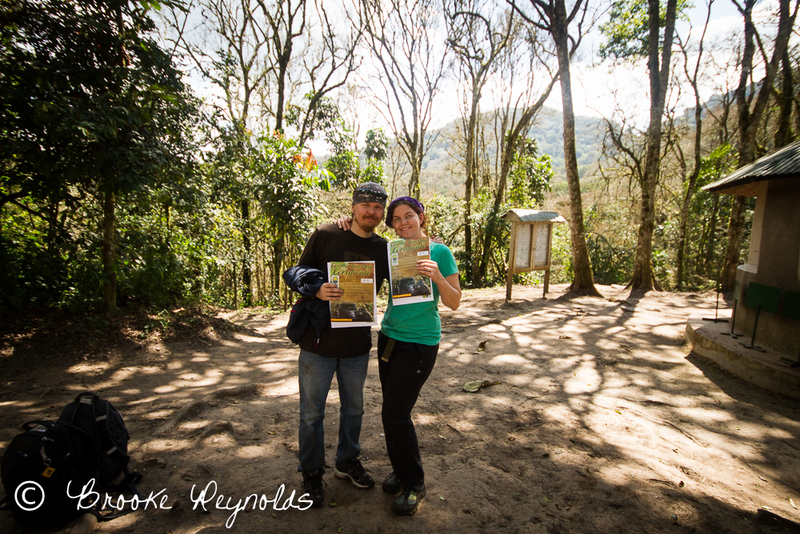 We loved our guides- Ronald, a long-time tour guide and Maria, who was a guide-in-training going to see the gorillas for the first time like us! 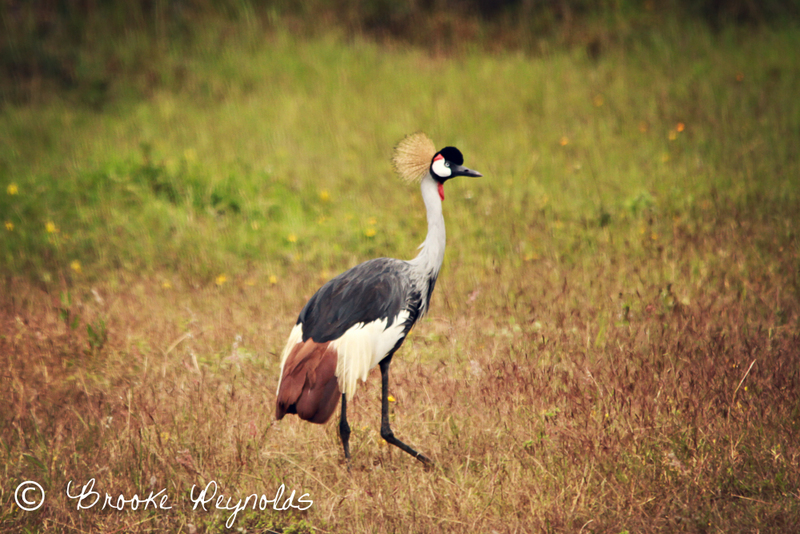 After driving across Uganda for a few days, from Kampala and going southwest through Queen Elizabeth National Park (this is worth a blog post too in the future!) 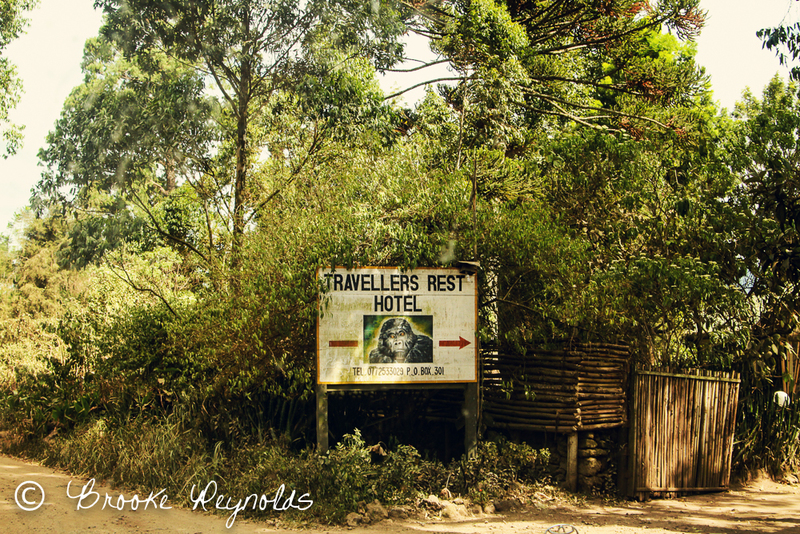 and towards the border of Rwanda, we arrived in Kisoro and stayed at the same hotel that the incredible Dian Fossey stayed many times- The Travelers Rest Hotel. 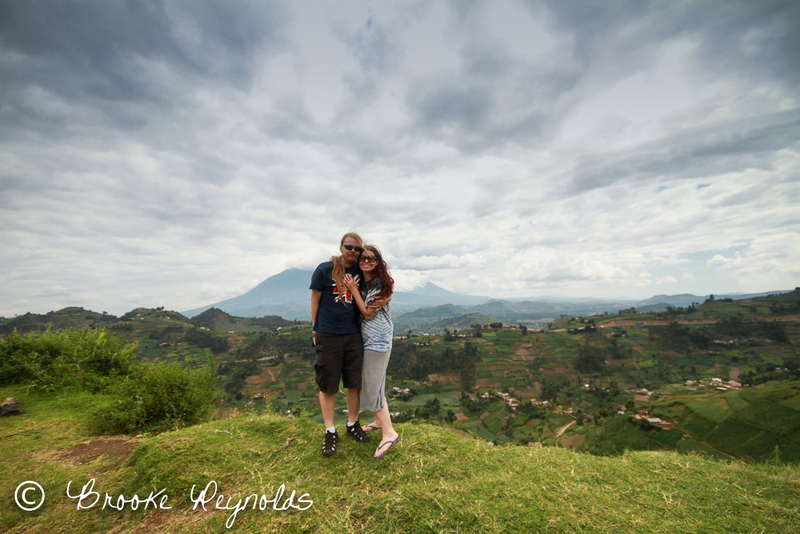 It had amazing views of the Virunga Mountains. 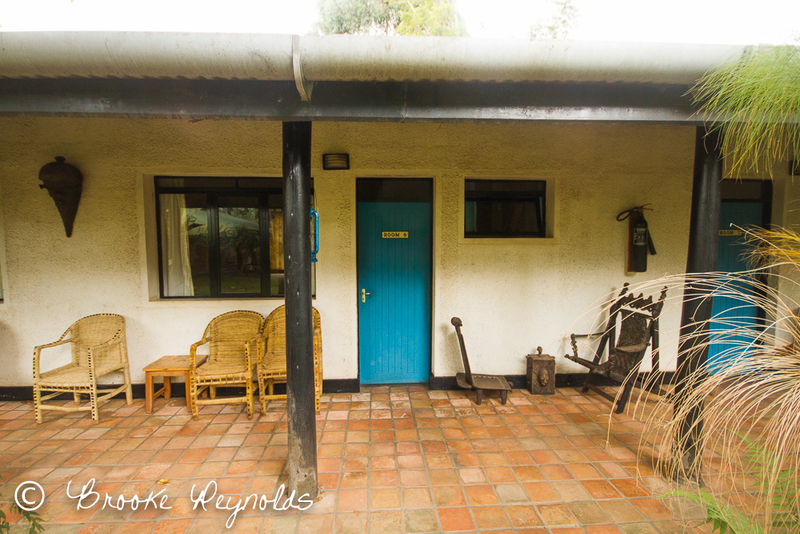 Where Dian Fossey stayed many times! We were so excited we could barely sleep! 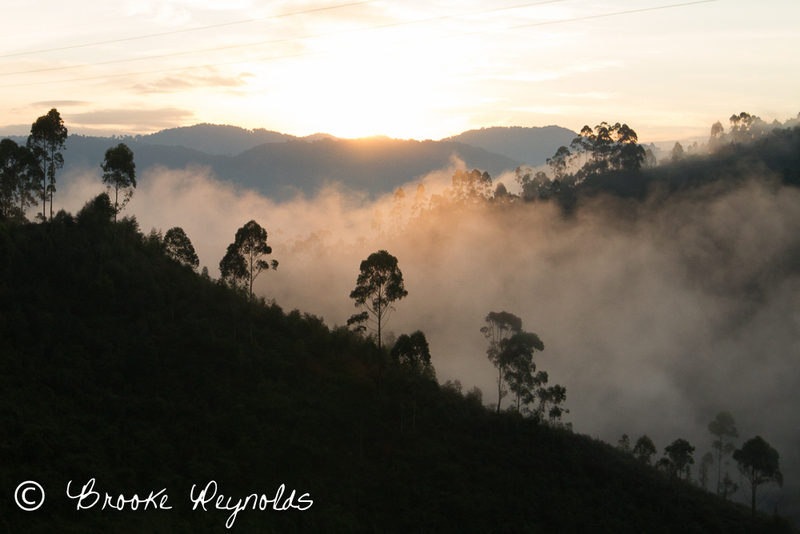 The next morning we woke up super early to make the drive to the Bwindi Impenetrable Forest, where there really was MIST rising with the sun. It was so beautiful and surreal. 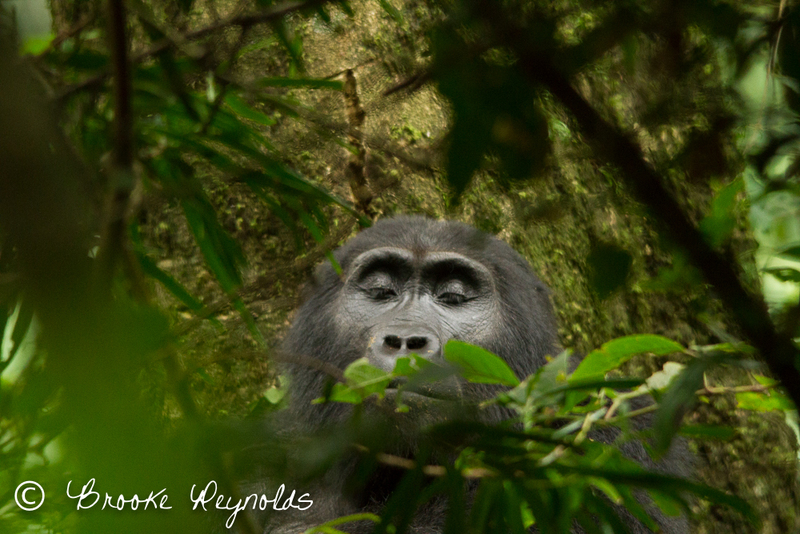 Ahhhh…gorillas in the mist <3. They gave us sticks for walking and porters were available to carry our bags on the trek. We weren’t sure if we’d need a porter, and almost didn’t get one. 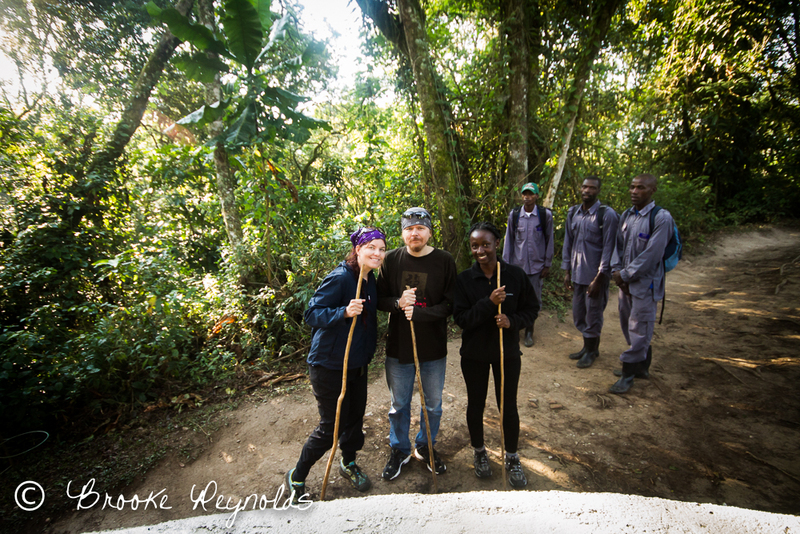 We were SUPER glad we did because they were helpful when we’d fall into a rut or be crawling up the side of a muddy hill with nothing to grasp onto, the porters would hold down a stick and help pull us out. A couple that was trekking with us opted out of getting a porter and they were struggling and lagging pretty far behind. See the cliff? You never know when you might walk into one not knowing it! After we got off the beaten path, there were no trails; we were going straight through the jungle not knowing if we’d be hiking for 2 hours or 6 hours and then back. 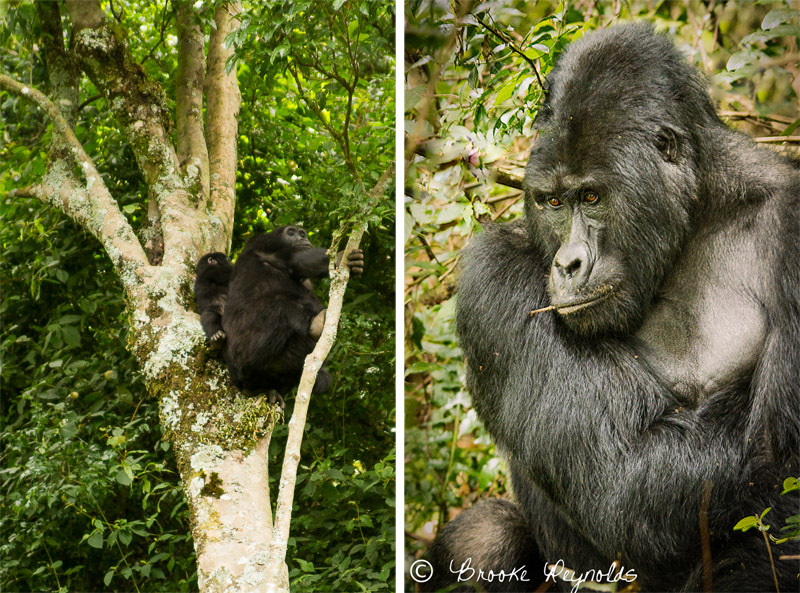 It all depended on when/if we spotted a gorilla family. And when we did, we’d have only one hour to watch them from a distance. This rule is in place to allow the animals freedom to not be bothered by humans 24/7. Also, only a certain amount of permits are allowed per day and that’s it. Those were stinging nettle bushes we walked through that burned if you touch them with bare skin! 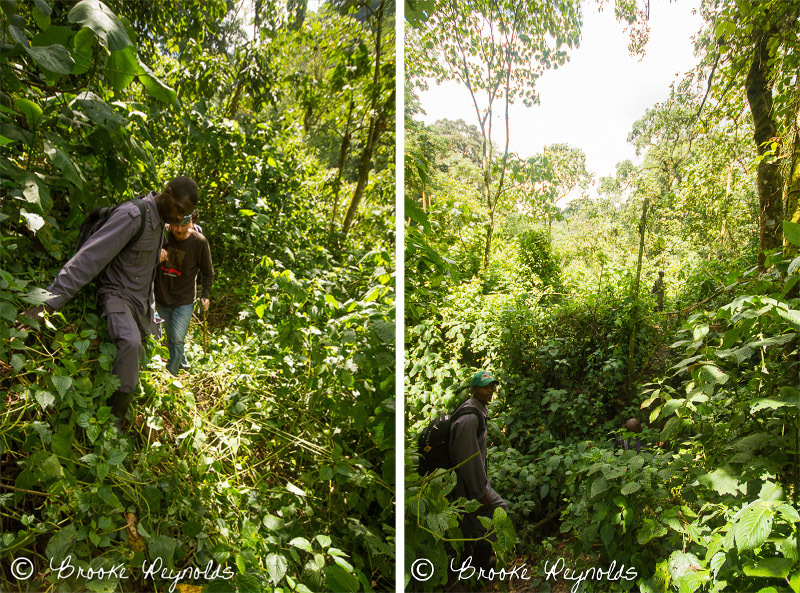 As we quickly learned, it’s called the ‘Impenetrable’ forest for a reason- the hiking was the most strenuous we’d ever done. 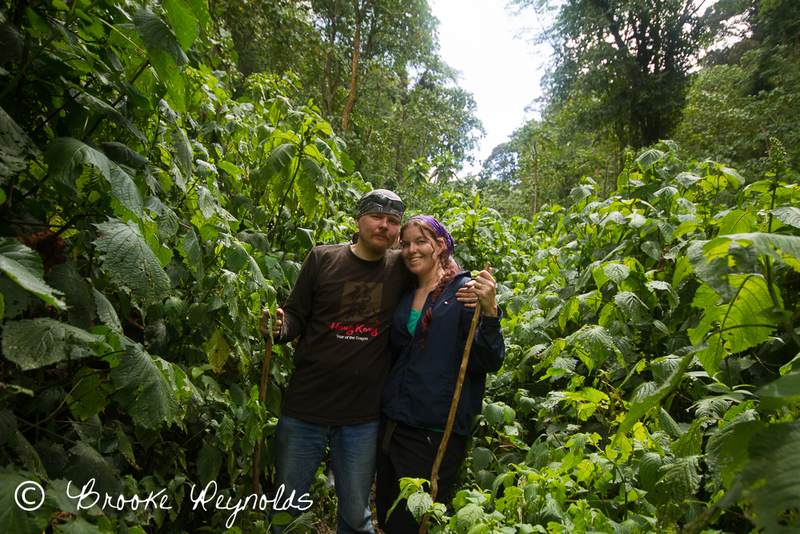 We had guides in front of us with machetes clearing the way of the heavy brush. Behind us, there were men with guns in case a wild elephant came out of the jungle, they would sound off the gun to scare them off. 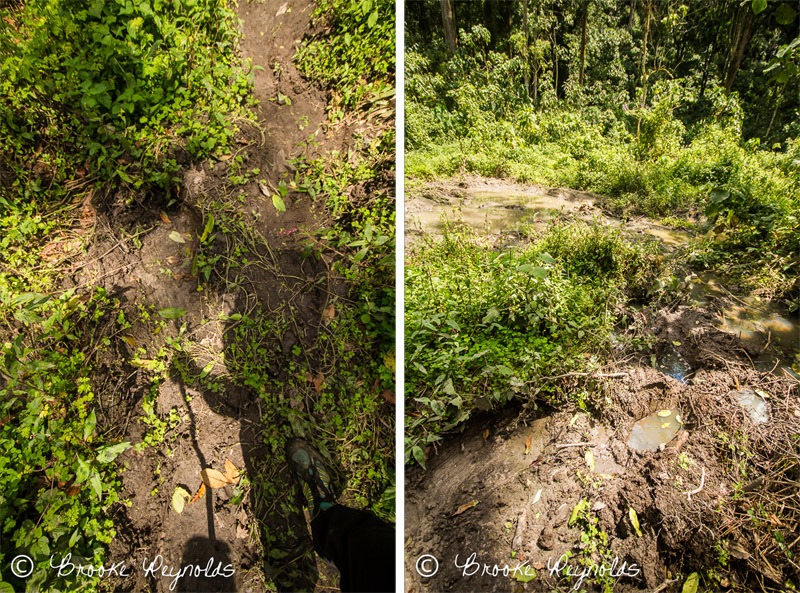 That didn’t happen, but we came close, walking over some HUGE elephant poo and tracks in the mud that we had no choice but to walk through. I now call those shoes the elephant poo shoes 😉 It took some effort to scrub that off later! 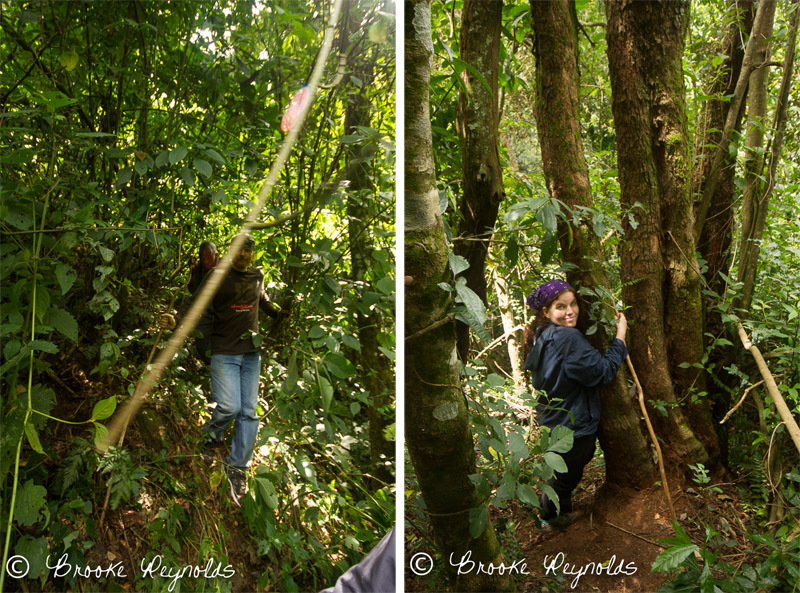 Through thick brush, we kept on climbing up the mountain, falling in ruts and sliding occasionally. At one point, I’m pretty sure I was about to nearly fell off a cliff when my porter dude grabbed my arm and pulled me out! 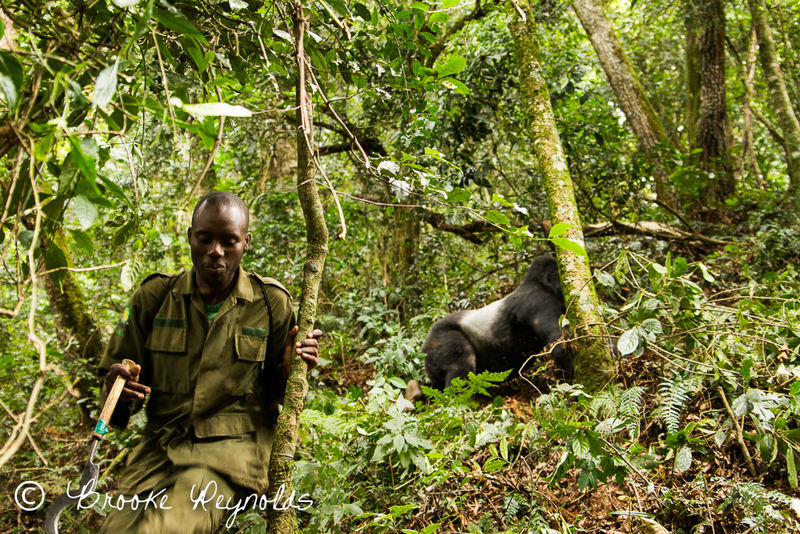 After about two and a half hours of heavy trekking, the guide in front was radioed and told us we are getting closer to where the gorillas were last sighted! And then we seen one- a ball of black fur hidden behind tons of brush. And her face- she was taking a nap! 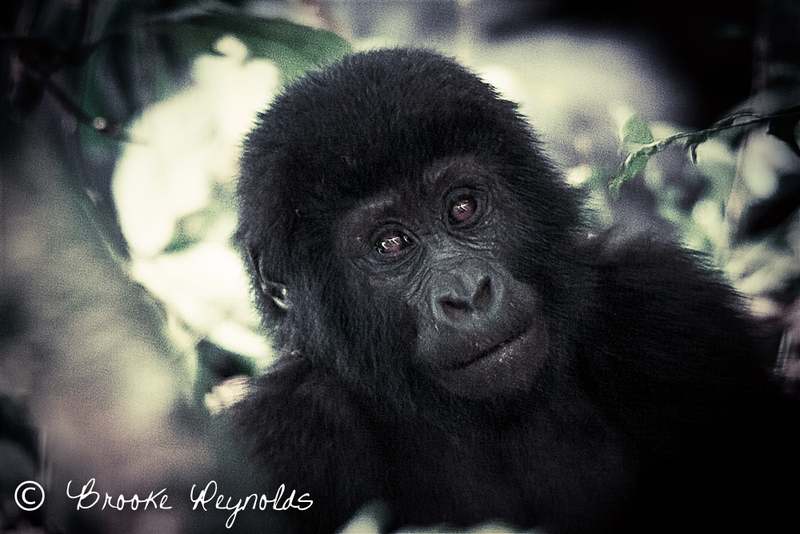 Mama Gorilla… such pretty eyes! 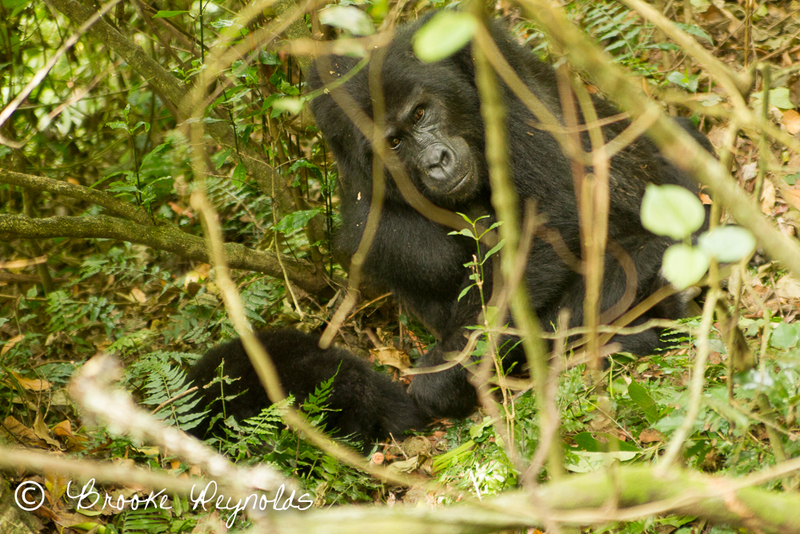 We cleared the way more and seen the whole gorilla family was there, chilling on the side of the mountain. I was in complete awe. It was an awkward position where they were laying. To get closer, I had to hold onto a tree to keep from falling off the side and I frantically dug my camera out. We were under a lot of shade as well, so it was pretty dark and hard to see. Most of my photos turned out blurry due to this. But even though I’m a photographer, there are times when I just have to put my camera away and just enjoy the moment and the experience. Which I did after a few minutes of shooting. Here was the mama and her two babies. AND there was the silverback male in all his glory. Just chilling out trying to take a nap. They didn’t seem too disturbed by us. The young ones were full of energy, hopping and climbing around. They were even beating their chests and falling over! SO CUTE. Jerrod was approached by the littlest one, who started climbing up the hill towards him and was about a foot away from his leg when her mom swooped in and grabbed her and off they went! The hour we had to observe them went by WAY TOO FAST. But I respect that they keep the human interaction minimal. And the silverback was ready to move on anyway, as he stood up, let out a loud grunt and took off through the forest, his family moving fast to follow him. One of the guides had to jump out of the way! Then we started the 2.5 hour trek back! It was all worth it!! 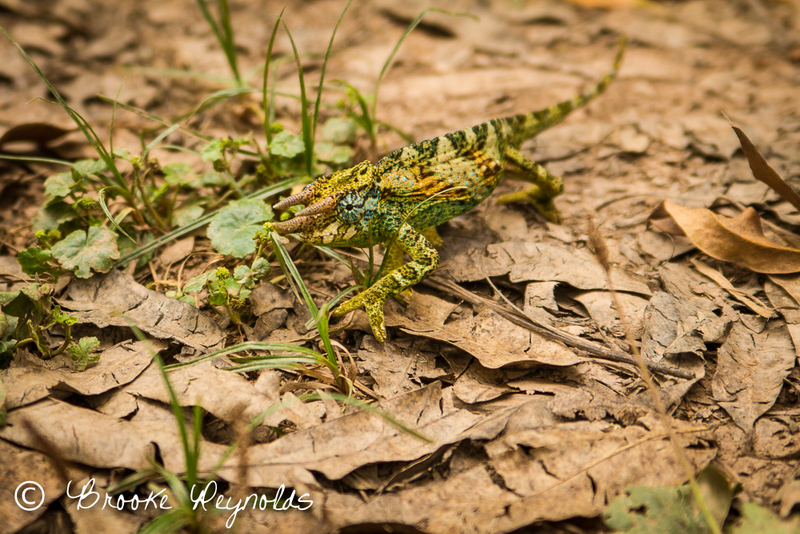 On the drive back to the hotel, there was a super cool surprise on the road- a THREE-HORNED chameleon! AND I nearly got arrested when I got out of the car and ran over to take a photo of this bird, not knowing I was near an airstrip which I guess is illegal! The authorities pulled us over and questioned us for a half an hour and nearly took me in for more questioning, but Ronald explained we were just tourists and had to get back to the hotel. They argued for awhile and they finally let us go! Whew! All in all it was an amazing experience! 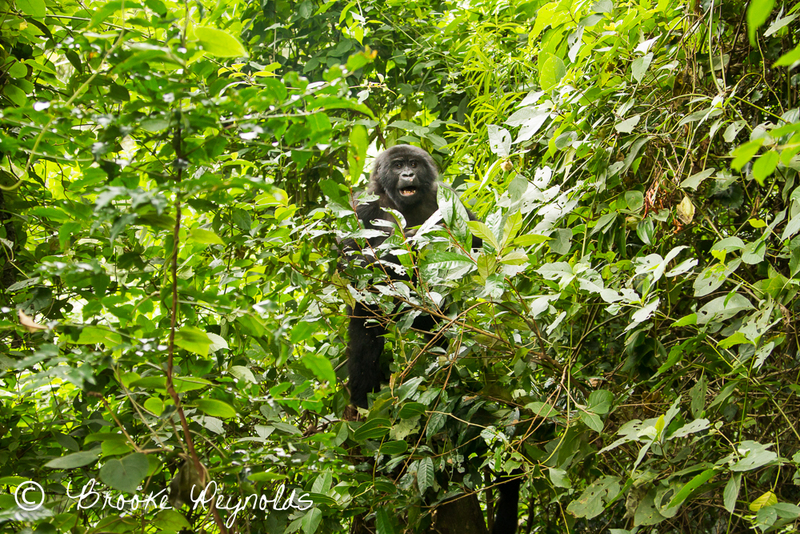 I’ll do another post soon about the chimps and other animals we seen in other parts of Uganda!